The Madina Mall is a mid-sized shopping mall in Al Qusais, to the north of Dubai International Airport. Shoppers here are mainly local residents. Around 100 stores and food outlets are spread over two floors. 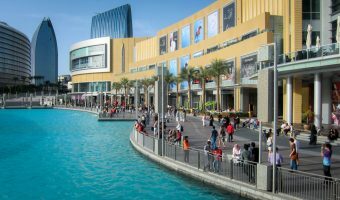 Anchor stores are Carrefour, Pan Emirates, and Babyshop. Shops and places to eat and drink at the Madina Mall are listed below. Listings were last updated on March 1, 2019 . Affordables – Fashion for men and women. AM PM Watches – Watch shop. Ari O Rotti – Indian restaurant. Babyshop – Children’s clothes, toys, nursery furniture, prams and strollers, car seats etc. Borjan – Shoes, bags, and accessories. ChicKing (Food Court) – Fried chicken. Country Club Fitness - Gym. Daman Phone – Mobile telephones. Design Own Art Services – Custom phone cases, photo frames, mugs etc. Dorna – Typing, photocopying, document processing etc. Dr. Nutrition – Health foods, sports nutrition etc. Emirates Sports Stores – Sports clothing and equipment. Fancy Land – Fancy dress costumes for children. Haji Ali (Food Court) – Juices. KFC (Food Court) – Fried chicken. Kostumes – Fancy dress costumes. Max – Fashion for all the family. Morning Star – Car rentals. Organic Vita Sana – Store selling organic foods and products. Pehlivan (Food Court) – Offers a variety of cuisines including Turkish, Italian, Indian, and Chinese. Pizza Hut (Food Court) – Pizza and pasta. SellAnyCar.com – Instant car sales. Souvenir Phones – Mobile phones and accessories. Tim Hortons – Coffee, sandwiches, and baked goods. uniCare Medical Centre – Healthcare centre. Facilities at the Madina Mall include a children’s entertainment area and a covered car park. The food court is located on the upper floor. The mall is open every day of the week. Standard opening hours are 10 am to 10 pm on weekdays, and 10 am to midnight at the weekend. The Madina Mall is located on Beirut Street, on the eastern edge of Al Qusais. There are no Metro stations within easy walking distance. The closest is Al Qusais Metro Station (Green Line), approximately 1.5 miles from the mall. Map showing location of Madina Mall.